If you’ve never ice skated or played hockey before you have completely deprived yourself of an activity that is soul-cleansing! Do it once and you will want to do it again, get better at it and you will do it for life!!! What is the Hockey High? The first time you touch the ice there’s a feeling of heightened awareness, your insecurity of balance, the excitement of the unknown!!! The conflicting questions race through your mind, but you seem to answer each one! “How fast can I go? I’m not going to be able to go fast. Can I even stand up? Wow, I’m standing up, but, MAN this is hard,”…and so on it goes. This kid has the hockey high! What is the Hockey High? 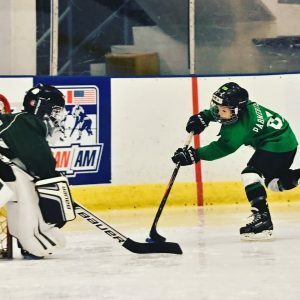 It’s the adrenaline rush and excitement you feel from ice-skating and playing the beautiful game of hockey, it’s like no other. Beginner or veteran player the same, your blood rushes through your body down to your legs, your core engages completely, and fires like no other exercise as your arms swing and your legs drive you forward with a sensation of floating through the air. Your quads burn, glutes fire, while your ankles are locked and released as you finish every stride with a violent snapping of the toes. The hip flexors are coordinating the return of each stride with maximum efficiency. Your upper body is secure and presented forward while your arms are reaching to add another five inches to each stride to ensure maximum length. The balance and awareness of every movement clear, the force provided to the ice and the lightness of each glide allows for a smooth, fast ride. When the skate is complete, you realize, my knees don’t hurt, my ankles don’t hurt, my hips don’t hurt, there is no impact when you’re ice-skating, there is no impact when you’re turning, when you’re changing direction and accelerating. You realize complete physical, emotional mental and spiritual satisfaction has been achieved. What is the Hockey High? It is the reason you can’t leave the locker room immediately following an unbelievably difficult skate. It’s the feeling of complete freedom in your soul and that solutions to life’s challenges are clearer. Your exhaustion has absorbed your fears and fueled you towards the next day. The three hours following a skate, your senses are heightened, your mind clear, your heart open, as you sit and replay every moment of the two hours you were on the ice. You can see how moments in the game relate to the challenges of life as you find solutions to those challenges. You replay those moments over and over and when you’re done your mind is open and so clear and all the stress in your day has gone away, that is the moment you realize there is only one high, The Hockey High!!!! At the Hockey Hut, we strive to help guide you into, through, and out of this high. What if you had someone who knew how to push your performance to an unparalleled level? What if this Hockey High wasn’t a flash-in-the-pan moment but instead was an energy you could harness for more extended periods and perhaps become a way of life? Your potential is what propels us forward as we work on four areas of performance – mental, emotional, physical and spiritual. When you learn how to get each zone firing, the Hockey High becomes a life rhythm. Conversely, when you can master the areas ensuring that one never gets too low, your intelligence grows, and your performance is unmatched. In the end, life is more enjoyable when we can stay in the realm of creative and confident. Let’s partner together, and I promise that the Hockey High will be one of your most valuable resources against doubt, anxiety, stress, frustration, disappointment, and regret.